You know how much I love Sprinkled Pug stickers. 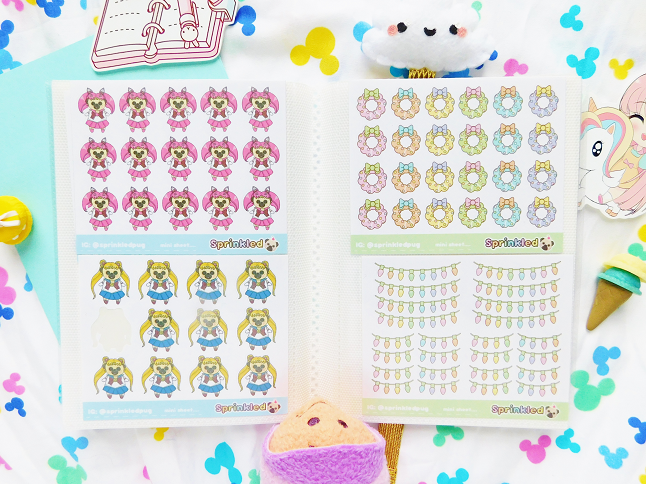 I'm always buying Liz's newest releases and weekly mini stickers sheets. A couple weeks ago she was selling her pastel Christmas collection on Instagram so of course, I bought them all! 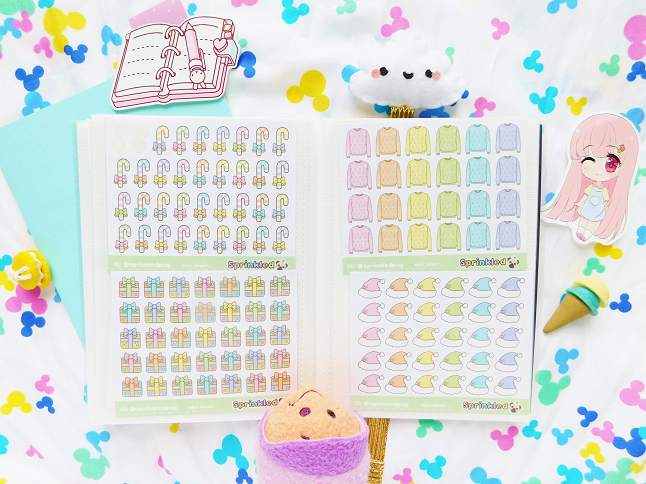 I'm not a fan of the traditional Christmas colors so these pastel stickers are perfect for me! I can't wait to use them in my December planner spreads! Over the Black Friday/Cyber Monday weekend I decided to place an order because I wanted some regular size stickers to fit my new medium Happy Planner. I got 50% off my whole order which is an amazing deal! The deal is still on if you are interested so make sure to use YOPUG50 to get 50% off your Sprinkled Pug order (no minimum). Now let's get into the fun part, the stickers! Let's start with some non-Christmas stickers first. These are some adorable pug puppies dressed up as the Sailor Scouts Mercury, Mars, Jupiter, and Venus. These are the miniature size stickers but there are regular sizes up in the Sprinkled Pug shop. 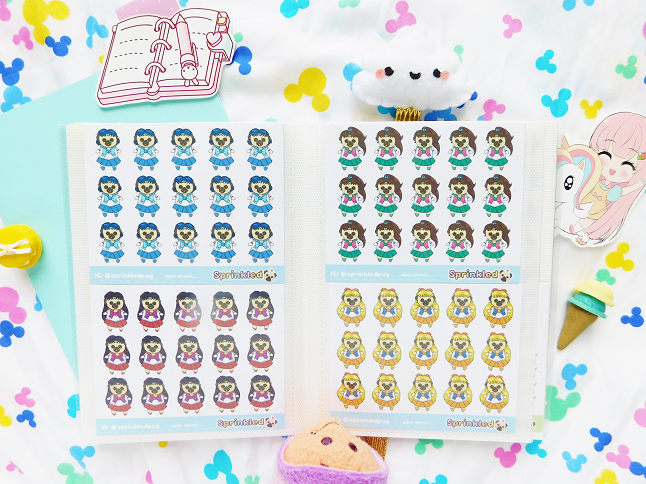 Here are the rest of the Sailor Pug stickers, Sailor Chibi and Sailor Moon. Aren't they just the cutest! On the left are some pastel wreath stickers and mini Christmas light banners. Candy cane stickers, gift boxes stickers, ugly sweaters stickers, and Santa hat sticker mini sheet. 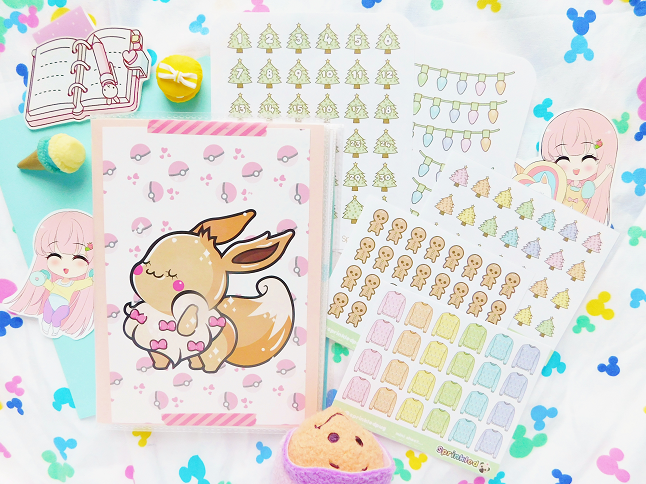 Pastel ornament stickers, gingerbread stickers, pastel Christmas trees, and stocking stickers. 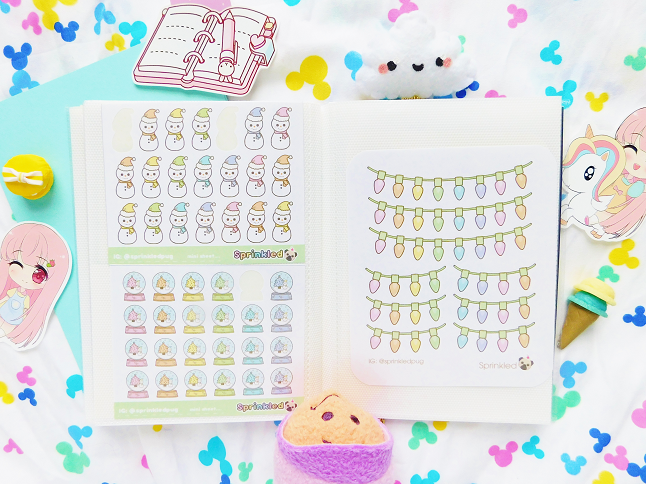 Snowmen stickers and snow globe stickers are the last mini sticker sheets. The rest of the stickers are the stickers I ordered during the Black Friday sale. I know I have the mini Christmas light banners already but that was before I ordered my new planner so I was going to use the mini ones in my mini Happy Planner. 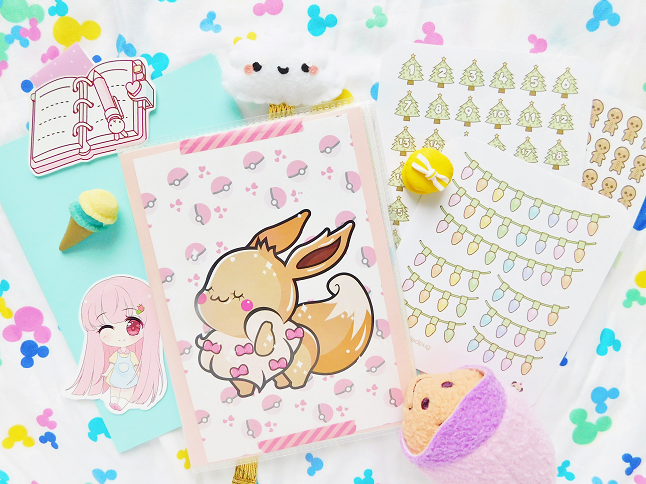 Pastel Christmas tree stickers and Christmas tree date stickers. 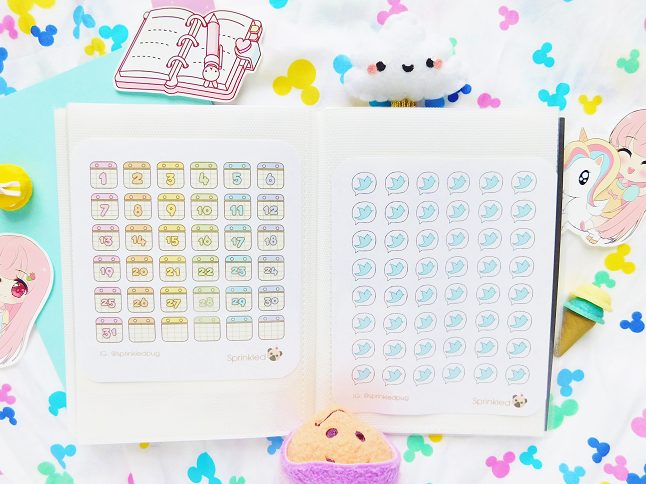 Pastel calendar date stickers and Twitter stickers. I already have the Instagram stickers which I use to track the days I post a picture on Instagram but I didn't have any Twitter stickers so I bought them just so I could have them. I was thinking of using them to remind me to schedule Tweets but if any of you have other ideas I'm all ears. 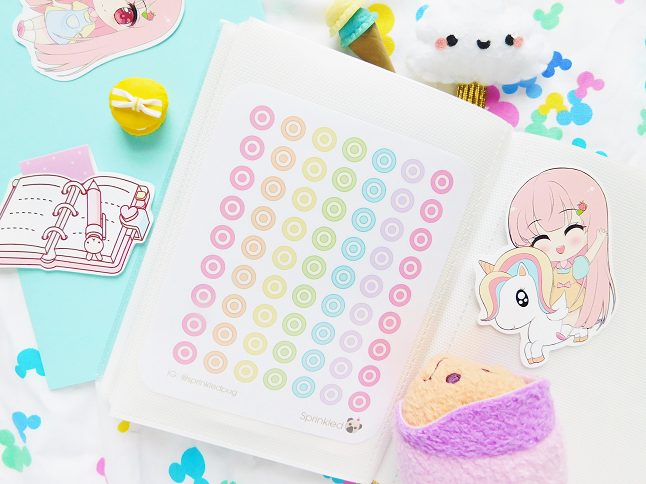 Lastly here are some pastel Target stickers. I'm surprised that I didn't own any Target stickers already because I'm always going on Target runs.